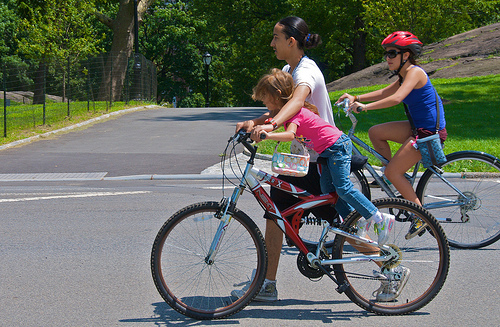 Upper West Side residents want to make Central Park once again a welcoming place for recreational cyclists, based on the near-unanimous position of Community Board 7’s parks and transportation committees at a joint meeting last night. But with the NYPD intransigently committed to its ticketing blitz and DOT unwilling to pay for changes to the traffic signals in the park, it’s not clear how to move forward. Some bright news is on the horizon for cyclists hoping to use Central Park for transportation, however: Two east-west routes through the northern end of the park should open this summer. The widespread agreement, however, didn’t extend to the question of how to best facilitate cycling during car-free hours. The problem is that there isn’t an easy fix within reach. City Council Member Ydanis Rodriguez introduced legislation last week that would require traffic lights in parks to be blinking yellows during car-free hours. It currently has the support of Council members Gale Brewer, Vincent Gentile, and Brad Lander. Blinking yellows, however, also are opposed by the city. According to Neuwelt, DOT thinks that blinking yellows would be too dangerous for pedestrians and, given the old traffic signal technology in the park, be prohibitively expensive. Community members presented other ideas as well, each with its own set of drawbacks. Board member Suzanne Robotti, for example, proposed retiming the traffic lights to the speed of cyclists rather than cars as a way of allowing cyclists to ride without stopping while still keeping red lights so pedestrians can cross. There was a lot of enthusiasm for the concept until it was pointed out that cyclists travel at very different speeds. Similarly, Upper West Side resident Jim Zisfein’s proposal to add signage urging cyclists to stop for pedestrians ran into questions about what would happen when the signs’ instructions conflicted with the message of a red or green light. Ultimately, the community board did not endorse any specific plan. Instead, the next step will be a meeting of all the stakeholders organized by Council Member Gale Brewer, who was in attendance at last night’s meeting. More concrete progress was announce on plans to allow cyclists to cross the park from east to west. The Central Park Conservancy’s Caroline Greenleaf announced that the first two crosstown routes would be open early this summer: one along roughly 102nd Street and one along 96th. The park is still working with DOT on configuring the entrances and exits for the 102nd Street path. “If these two paths turn out to work well for everybody,” said Greenleaf, “we’re looking to expand them southwards.” One future location would go along the north side of the Great Lawn, at roughly 86th Street. Below that, it’s not clear where any additional routes would go. Higher pedestrian volumes at the southern end of the park and automobile traffic along 72nd Street present challenges, according to Greenleaf. The paths are likely to have strict rules limiting bicycles. “There will be some sort of speed limit,” said Greenleaf, likely either 5 miles per hour or “walking speed.” “These paths are so heavily used,” she explained. The community board did not offer a formal resolution on the east-west bike routes, but seemed very supportive. Board members uniformly spent their time suggesting possible low-conflict routes for the southern end of the park, not critiquing the proposal. 102nd Street? Isn’t there one there already? I’m not confident that I can ride at 5mph without falling over, but I’m still excited about the paths. Assuming that the NYPD doesn’t park alongside with a radar gun to make sure I’m not doing 8 in a 5 zone. This is soooo utterly frustrating. We have to get the City to sign off on everything!?!? I mean really, the DOT opposes just switching it to Flashing Yellows all day? This is a bunch of paternalistic BS. Seriously. Instead we have red lights that nobody obeys because, they’re frankly stupid. It’s a f—ing park. I don’t want to have to unclip every 90 seconds to stop at a light where nobody’s at. Like, when I ride late night, there are no pedestrians, and these BS DOT people are like, yah, we can’t just make it a blinking yellow, that’d be unsafe. Meanwhile, you ever try riding cross-town on those traverses http://www.streetsblog.org/2007/08/22/central-park-66th-street-transverse-is-unsafe/. I’ve done it once and I nearly got killed. And they don’t ticket the Cars. I’M SICK OF THIS BS THAT BIKERS ARE SOMEHOW DANGEROUS!!!!! This seems to be a case of the city government trying to rein in a runaway police department. The solution should be to have the mayor – the head of the executive branch- demand that his police department stop it. It’s probably in the city council because everyone knows that they can’t do anything. “Runaway police department” I like that. The NYPD has been a bastion of corruption and counterproductive enforcement for all time, as far as I can tell. Unless we see some great reformer fill Ray Kelly’s place once he is gone, this is going to be a long battle for a civilized, democratic or safe city. Timing the lights to say, 16mph would help no matter what if the green light part was sufficiently long, it beats stopping at every single light. They could also set the lights at the northern end of park to 16mph, and the lights at the south end to 14, and people could pick the loop they wanted to do. Where are they going with this? The cops have to know that a ticket blitz against the residents of CPW, 5th, and Parke Ave isn’t going to happen without a huge backlash. There must be some goal or reason in the big picture, but I can’t figure out what it is. Has anyone here just escaped from the police when they try to pull you over? Seems it would be possible to do on a bike in central park. The question is juvenile and certainly counterproductive to developing a respectful relationship with law enforcement, of course, but I find myself curious about it in the context of unfair ticketing.